Got your 13th-month pay or Christmas bonus already? Now, here’s a sale worth your every penny, and you won’t even have to worry about your wallet: a book sale! 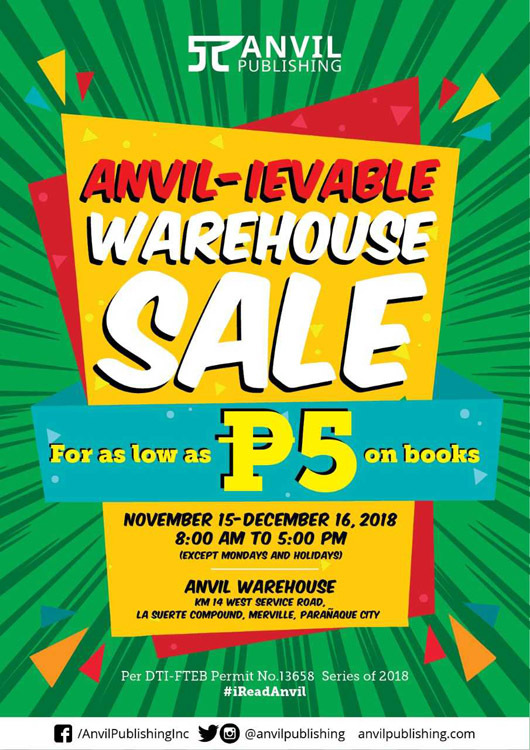 Anvil Publishing is having a warehouse sale that runs from Nov. 15 to Dec. 16 (yes, that’s a month-long bargain) where you can get books for as low as P5. Located at KM 14 West Service Road, La Suerte Compound, Merville, Parañaque, the “Anvil-ievable Warehouse Sale” is open from 8 a.m. to 5 p.m., except Mondays and holidays. New releases and regular-priced books get 20 percent off as well. Anvil is known for being one of the top publishers in the Philippines bearing titles from renowned Filipino writers like Nick Joaquin, Carmen Guerrero Nakpil, and Lualhati Bautista. It also has the companion books of films Heneral Luna and GOYO: Ang Batang Heneral. The publishing house also carries Spark books, the romance titles, and Pride Press, the LGBTQ+ titles. To know more about Anvil, visit its website here.